Home > TRIPS > Hiking by Como lake in Italy. From Lecco to Monte Resegone. Hiking by Como lake in Italy. From Lecco to Monte Resegone. I remember the hike to Monte Resegone with mixed feelings. On one hand – amazement. Breathtaking nature, dramatic views, mysterious clouds, one of the most beautiful places I have ever seen. On the other hand – anxiety. Lack of trail marks, no information on how far it is to the top. Steep trails. Uncertainty if we can make it. One thing for sure. It’s not possible to be bored in Italy. According to the maps, to avoid via ferratas – trails which can’t be accessed without a lanyard, climbing harness and helmet, we have to stick to the trail number one. Easier said than done – the Italians are not good at marking their trails… We got lost quickly and found ourselves close to a rock wall with some climbers on it. A beginning of via ferrata. The trail was steep but not very difficult. We made a short stop in Rigugio Stoppani mountain hut. The further from the hut the steeper the trail… After some time we got to a trail crossing. One way led to the top station of Piani d’Erna cable car, the other one to Monte Resegone. We didn’t hesitate long. We took the trail to Monte Resegone. If you don’t have good shoes, a lot of stubbornness or you are afraid of very narrow trails which are so steep you need to use your hands – don’t take the trail 1. Turn to Piani d’Erna. Trail from Lecco to Monte Resegone: Almost there! We didn’t stay up there long. It was getting late if we wanted to get down before dark. We entered Luigi Azzoni mountain hut to make sure we will get to the top station of Piani d’Erna taking the trail going down to the other side of the mountain. The owner confirmed and we were delighted we don’t have to take the same steep trail down. The sign confirmed we should stick to trail number 17 to get to the cable car. Again, the trails were not marked well… We got stressed already if we are going to reach our destination or we’ll have to spend the night in a small village on the other side of the mountain. Reaching the top station of the cable car took us around two hours. It was late already, we were tired. That’s why we decided to take the cable car down to Lecco. It cost 6 euro per person, but we knew it will get dark soon. We didn’t want to walk down at night. My Endomondo says this was a 14 km hike with over 1900 meters of elevation gain. Endomondo isn’t the most trustworthy and 1900 m seems a lot but I was so tired after the hike that I believe it totally. It took us six hours. If we decided to go down on foot instead of taking the cable car, it would add around 4 kilometers to the hike. If this scared you, let me remind you there is an equally pisturesque but way shorter and easier hike from Lecco to Monte Barro. We came back to Bergamo late in the evening. It’s been a while since I’ve fallen asleep so deeply and so fast. I think it’s because of all the emotions. On one hand – anxiety. Lack of trail marks, no information on how far is it to the top. Steep trails. Uncertainty if we can make it. On the other hand – amazement. Breathtaking nature, dramatic views, mysterious clouds. One of the most beautiful places I have ever seen. 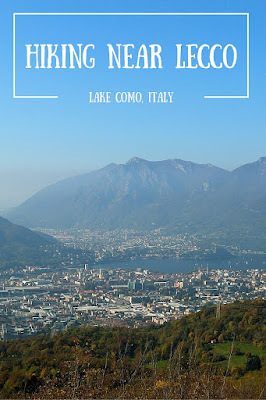 Now, book your accomodation in Lecco! Thanks for reading my article. I hope I encouraged you to do this outstanding hike! Now it’s time to book your accomodation in the most convenient location – Lecco. Using the below booking.com searchbox changes nothing for you – but it does change the world for me! You will pay the same anyway but instead of giving it all to booking.com team, a little chunk of it will go to me for the hard work and time I spend developing this place for you! Thanks! And if you liked this post, please use the buttons below and share it on Facebook, Twitter, Google+ or pin it on Pinterest! Thanks!